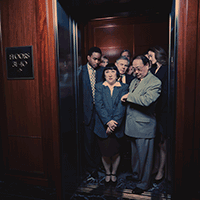 A Russian and an American step into an elevator – let’s say the two know each other vaguely as colleagues at work. If this elevator happens to be in America, what ensues is likely a very uncomfortable (Russian) and confused (American) exchange, triggered by an innocuous American “How are you?” If the Russian is not hip to the ways of this country and follows her own cultural intuition, one of two possible responses occurs to her: bemused silence or total transparency (“Well, my dog just got run over by the neighbor and I have one hour to replace him before my kid finds out, and my heartburn is really flaring up today”). When I was a child, my family moved from Russia to America. When my father landed his first office job at a software company, his favorite anecdote over the dinner table featured his colleague running to tell his boss of a terrible crisis requiring an immediate response. But before launching into news of the crisis, his colleague paused at the door to invariably, conscientiously perform the serve and return of “Hi Joe, how are you?” “Fine, thank you.” An American would ask “How are you?” of the grim reaper on his day of reckoning, was my father’s conclusion. Having lived most of my life here, I tend to think that such a meeting could only benefit from being friendlier. Dutch organizational theorist Dr. Fons Trompenaars popularized a handy metaphor based on his model of national culture differences for broadly thinking about the two basic types of culture we see arising here: peaches and coconuts. In this visualization, cultures that are peaches, like America, have a soft and friendly exterior. They are open and warm with strangers, but once you get to the deeper stuff (personal details, subjects that aren’t sunny), there is a hard, inner shell that is difficult to penetrate. Coconuts would be the opposite – a forbidding shell on the outside, but get past that and you have a loyal friend for life. When a peach and a coconut socially interact, without perspective, these two could form some pretty negative opinions of one another. These social differences extend far beyond the United States and Russia; travel to another country and immediately notice that the rules of social interaction have changed. The waiter at a Czech restaurant is not going to ask how you’re doing today. Having a conversation with someone from Sweden, Finland, or Norway means you have something of substance to say, otherwise silence will do just fine. On the other end of the spectrum you will find China. Here, small talk is considered polite and highly appreciated. In the Chinese business world, a first meeting is exclusively about getting to know one another and exchanging pleasantries (complimentary anecdotes about your experiences in the country so far are encouraged). In West Africa, business is conducted similarly to the United States – it is polite and even ritualistic to ask after one’s family, health, and work, however any details falling outside of the “everything is going well” spectrum constitute a social faux pas. Of course, these are very generalized statements, and will not account for individual personalities or the level of familiarity someone has with other cultures. However, it can be fruitful to examine the historical conditions that contribute to cultural norms when you’re comparing peaches to coconuts. Let’s take the countries that were part of Soviet rule for an example. The people living under that regime were accustomed to a politically and economically hostile environment, which created small, tight-knit social groups of only close friends and relatives. Strangers were distrusted. A Czech woman in her 60s once told me that she frequented a pub weekly with a group of friends for many years. Once Czechoslovakia was freed from Soviet rule, it came to light that one of those friends had been an informant for the secret police all those years. It was a matter of luck that no one said anything critical of the regime in these pub talks, or they would have promptly disappeared. It is no wonder that she has a hard time opening up to new people, she told me, when her life’s experience had taught her that sometimes you can’t even trust your friends. What Russians may not realize when they first encounter it, is that this little conversation: “Hey, how are you? Fine, how about you? Good, thanks,” is basically synonymous with zdravstvuyte, or “hello”). The idea is just to give a quick, positive answer. It’s a setup for the real conversation in a business meeting, the creation of a welcoming vibe for a customer interaction, or just an acknowledgement of the other’s personhood if it’s to a stranger in the street. Whether you think “how are you?” is a harmless bit of pleasantry or a conversational encumbrance that leaves a false taste in your mouth, it is entrenched in American culture, and to claim fluency in English is to breeze through that little exchange without a pause. Maria Diment was born in Russia and currently lives in Atlanta, Georgia, where she works in the Translations Department at ALTA Language Services.